In a summer of blockbusters starring various superheroes, it was easy for Hellboy II to get overlooked. But don't do it - the movie is worth a couple hours of your time, if for nothing else than Del Toro's unique creations. Mezco has been doing figures based off the movie, and just released their boxed set of 3 3/4" figures. 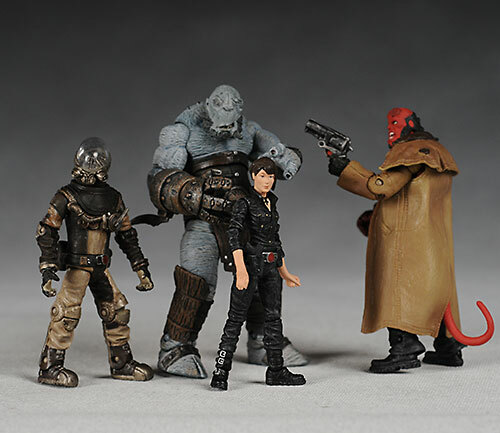 You'll remember I reviewed the uber-cool SDCC exclusive of Hellboy in this scale, and this boxed set is actually an early review, as these won't show up at stores for a couple more weeks. The full set only costs around $20, but finding it might be a bit tricky. A ton of retailers didn't pick it up. If you'd prefer to get them single carded, Toys R Us should have them soon. I love boxes. They are easy to store, and generally more collector friendly than other styles of packages. This set has a few twisties to annoy you, but it's only a few. And once you have them free, you can always replace them sans twisties if you'd like. 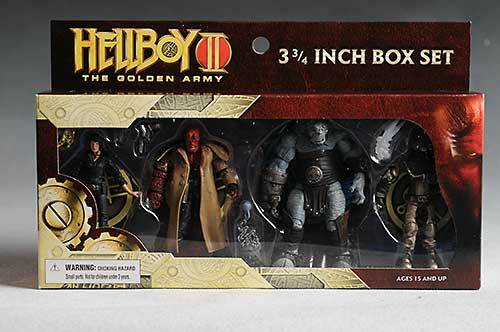 While I never reviewed the 7" line for Hellboy II (there's a guest review here), I did purchase the full set. 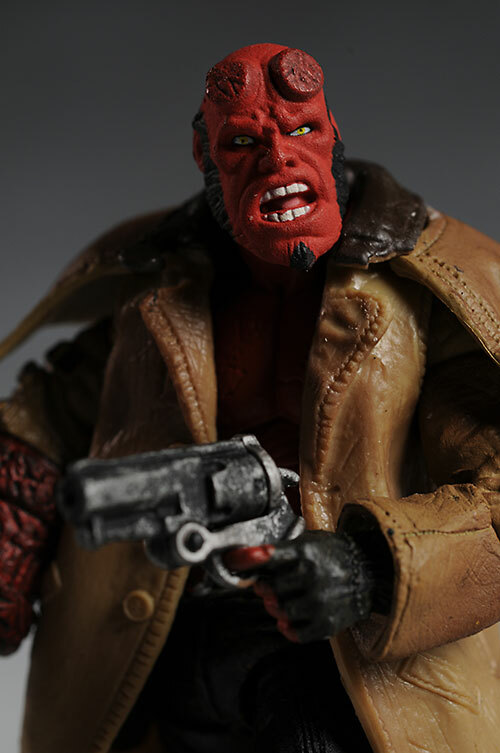 And while Mezco always does a nice job on the main man, Hellboy, it was Wink that really impressed me. The same is true in the 4" line. These figures are shrunk down versions of the 7" line, with the same general sculpts and articulation. However, even in this small scale, they managed to retain most of the excellent detail work. Wink has a ton of texturing and patterning, giving the skin its own unique look, and making the steel arm and leather clothing look quite realistic. The hands are done in threatening poses, and the face has the wounded scarring that I assume gives him his name. He stands great on his own, and clocks in at about 4 1/2" tall. On the opposite end is Liz. She's not a terrible figure, and she looks better in person than she tends to in photos, but she still has more issues than the other three. 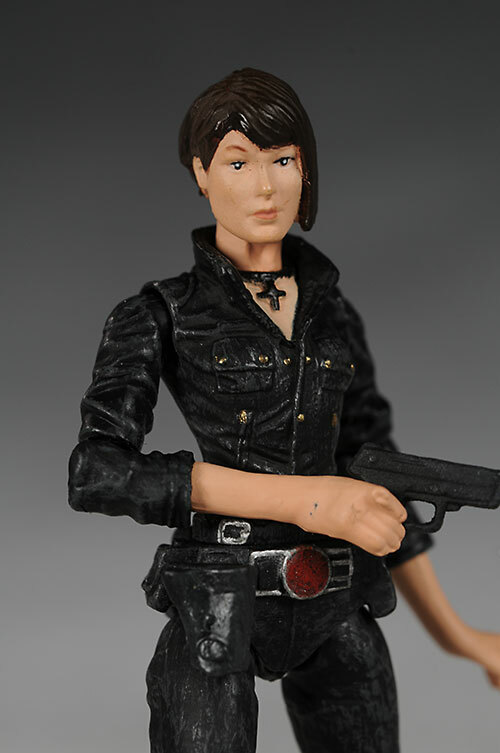 The face has a slightly softer sculpt, probably to give her a little more attractive, feminine appearance. The lanky body looks good, but the weird, long forearms are very distracting. And a girl's forearms really shouldn't be the thing that distracts you. Her hands are sculpted to work with the accessories, and she stands fine on her own in a number of poses. The sculpt and articulation don't work together quite as well as the other figures, but she's certainly still better than your average Star Wars or Indiana Jones figure in this scale. She stands about 3 1/2" tall. Johann Kraus and Hellboy both have great sculpts, with tons of detail that's translated down extremely well to this scale. Everything is here, from the tiny ribs on Kraus' tubing to the etching in the Right Hand of Doom. As with the others, the hands are sculpted to hold the accessories, and they both stand great on their own, as the sculpt works extremely well with the articulation. 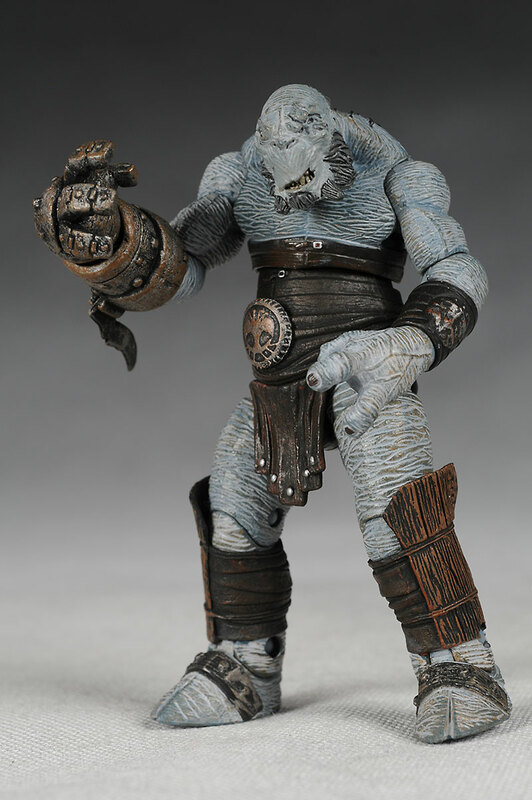 But while I like this Hellboy, I have to admit to liking the SDCC exclusive more. The big difference in this category is the head sculpt, with the cigar chomping look replaced by a open mouthed snarl. The calmer head sculpt works better for me. He stands just over 4" tall, just like the SDCC version of course. Johann obviously doesn't have a traditional face, but the clear dome is well done. They didn't add any smoke inside the dome, but that's understandable at this size. 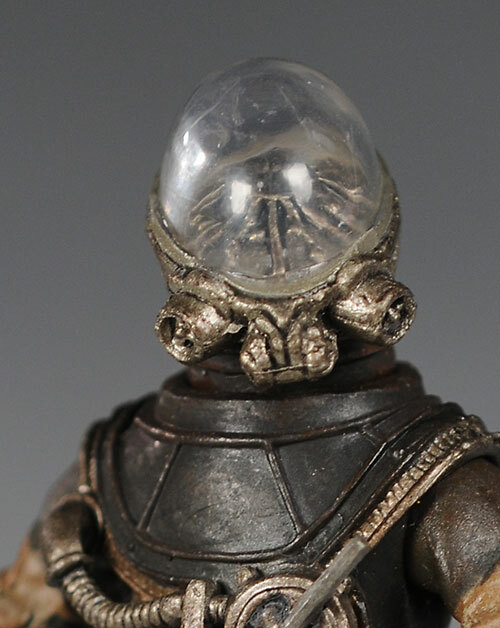 The dome is also not removable, unlike the larger version. He's right about 3 3/4" tall. The scale across the line is good, making the display far more appealing than one where scale is all over the place. Thanks for that, Mezco! Paint quality and quantity is never going to be at the same level in this small of a scale as it would be in a 7" or 8" line, but Mezco has done an excellent job keeping the work clean and detailed, all things considered. Of the four, Wink is again my fav. They got a little heavy handed with some of the wash on his body, but that's a minor complaint. Small details look great, and the work on his one good eye and mouth is excellent. While the wash on the body is a little much, the wash on the metal arm gives it a very realistic appearance. On the opposite end of the spectrum is poor Liz again. As I said before, that's not to say she's a bad figure - just not as eye popping amazing as some of the others in this set. There's a little slop here and there, but most if it is only noticeable under very close scrutiny. My only major issue with Johann is a more aesthetic one. He has a fairly heavy wash on his outfit, and it's a bit too much for my tastes, going past the intent of bringing out the details and adding shadows, over to the land of looking sloppy. 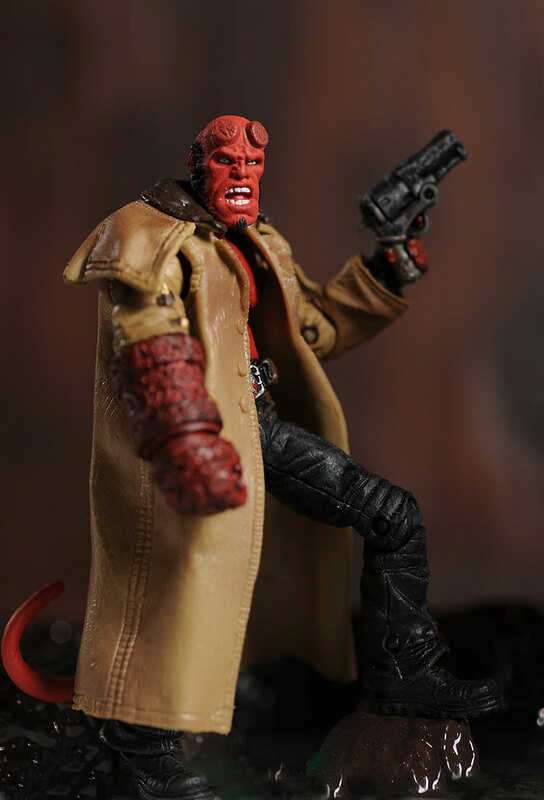 Hellboy is very similar to his SDCC counterpart, with the one major paint difference being the lack of the black shirt. The wash on his jacket looks good, and most of the small details are clean. These are some of the best articulated figures on the market in this scale, including most of the same articulation as the larger 7" figures. All of them have a ball jointed neck, and you know how much I live a ball jointed neck. The mobility is a bit constricted by Wink's sculpt, but the other three work terrific, especially Kraus. They also all have ball jointed shoulders, but Hellboy is the only one to have joints on both sides of the ball. The other three have the pin/post type of ball joint that only allows movement at the torso. The all have pin elbows, with the exception of Hellboy's right arm - the Right Hand of Doom makes that impossible. Hellboy's wrist on that hand is a ball joint, but the wrists (actually forearms on Liz) of Liz and Johann are cut joints. Wink does them all one better here, having his right wrist a ball joint, and his left a pin/post style joint. Moving further down the body, both Wink and Hellboy have the ball ab joint, but Liz and Johann have a cut waist. All of them have ball jointed hips, although Wink and Hellboy have joints on both sides of the ball, whereas Liz and Johann only have the ball inside at the torso. They all finish off with pin knees and pin ankles. Liz has one up on the boys here, as her feet also rotate. That's a ton of articulation for a figure in this scale, and while Liz's isn't as attractive as it could be (and her right leg tends to pop off), they certainly all deserve very high marks in this category. There aren't a ton of goodies here, but considering the price, there are more than you might expect. The back of the package says HB comes with his Big Baby, but that is not the case. I think the single pack figure will have it, but the boxed figure only has his Samaritan. Still, it's a very well done gun, and even breaks open at the breech. It fits well in his hand or holster, and looks great doing it. 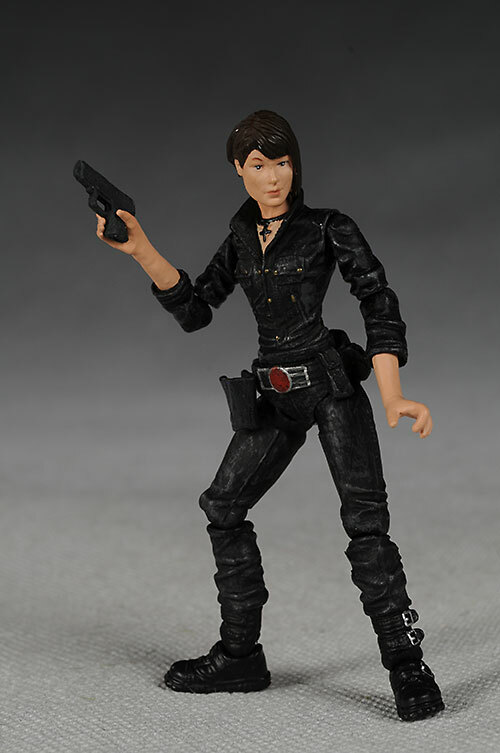 Liz also has her gun, and it fits in both hand and holster as well. She also has a small flame that can be held in either hand, although it takes a little effort to get it looking just right. Johann has two puffs of himself, that misty ectoplasm that the suit contains. This smoke is supposed to come from Johann's fingers, and it is possible to attach it to his hands to get a reasonable facsimile. 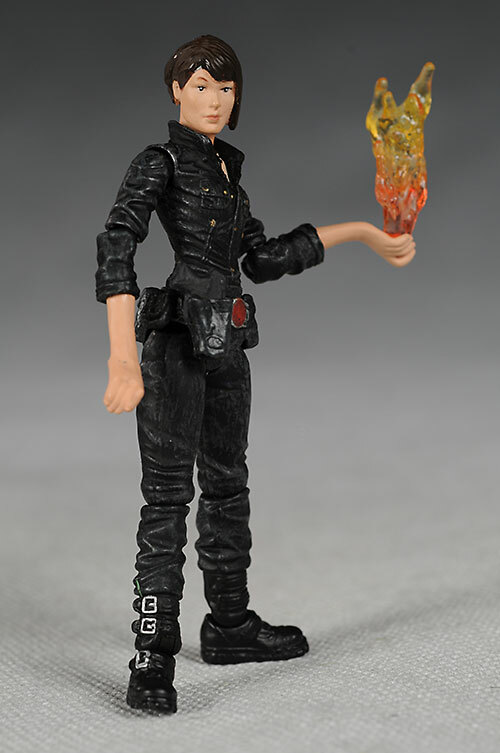 It's not as nice as the larger figure, where there were swappable hands with the smoke sculpted coming right out of the finger tips, but you can still get the general look. Wink only has one extra, but it is perfect for him - his extended hand. The hands pop off at the wrist ball socket, and the ball on both is sturdy enough to handle multiple swaps. 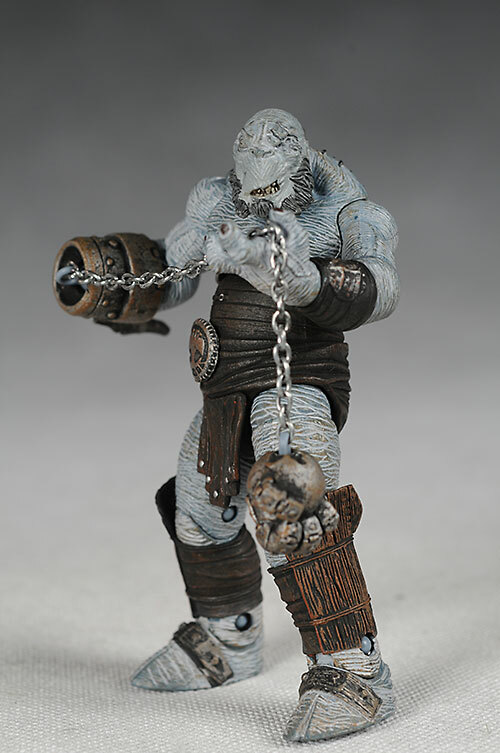 The chain on his extended hand is real metal, and it makes for a very lethal looking weapon. All four figures also come with a display stand. The three heroes have the agency symbol, while Wink's larger stand has the symbol of the evil dudes from this last flick. The stands work fine, and are a nice addition especially for this scale figure. Wokka, wokka, wokka! This is a set of truly fun action figures, merely pretending to be 'collectibles'. Put these guys up against the 'toy' releases in this scale from Hasbro or Mattel, and you'll see that these are the far better play things. The articulation works great, the construction is sturdy, and the sculpt and paint will satisfy even the pickiest kid (even the ones that haven't been kids in a long time). These days, you tend to pay around $7 - $8 for a 4" figure. That's an awful lot of green for such a little figure. Here, you're getting four figure for around $20 - some places even cheaper! They have display stands and a couple accessories each, all for just about $5 a figure. Now that's a great deal! Some of the joints were painted tight, but the pins seem sturdy enough to take the force necessary to break them free. However, if it seems like it might be too much, don't forget to try the freezer trick. I don't have anything against female figures in general, but I do find that I tend to score them lower than their male counterparts. It's not me - companies just seem to have a harder time with the more attractive feminine physique. And Liz isn't a bad figure, but when she comes next to something like Wink, it's hard not to notice her little flaws. Compared to the awful Marion Ravenwood we got in the Indy line, she's an absolute goddess. Wink is the best of the bunch, particularly since we got the slightly superior Hellboy as the convention exclusive. I like that head sculpt a bit better than this one, and the inclusion of Big Baby with that single carded figure is another big plus. Mezco is doing figures in this scale right though, and I really am looking forward to what they do with the shrunken Heroes line. - Corner Store Comics has the set at just $18. - Entertainment Earth has the set for $25. - last up was the 18" HB II figure. - Gentle Giant did some animated versions, including one included in the most recent release of the movies, and there was also a guest review by Poe Ghostal of the first DVD release of Hellboy. I looked at the regular release animated figures as well. - Mezco released series 1 of their movie figures, which are covered in two guest reviews, one here and one here. 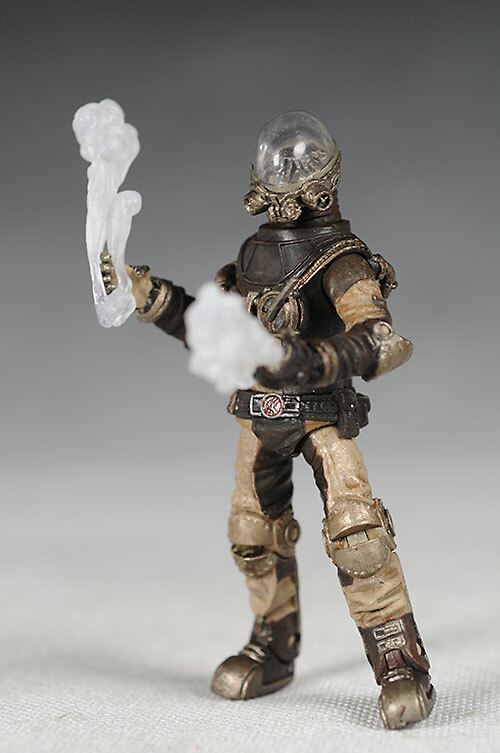 - I love the 4" line, even if the only figure we have so far is the SDCC exclusive Hellboy. 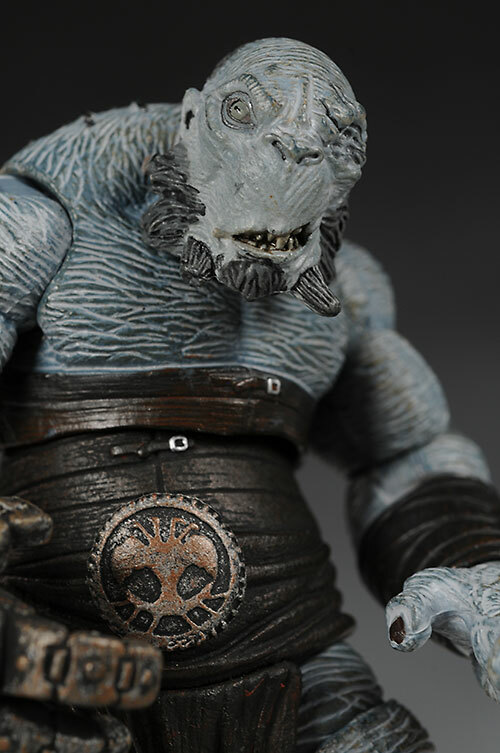 - I ran two 'retro reviews of the old Hellboy movie line - one for Hellboy, and one for Sammael. - I also have guest reviews of some of the comic based figures, including Kreigaffe #10, Lobster Johnson, and the old Graphitti Designs version. 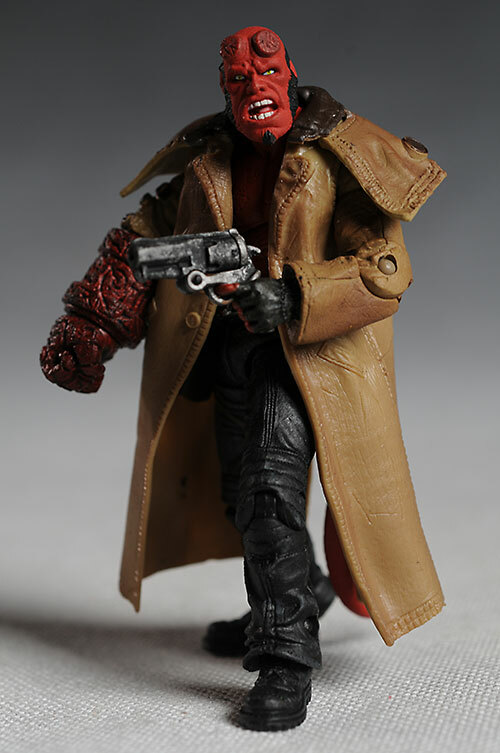 - I have my own reviews of the comic based battle damaged Hellboy and 18" version, the stylized Extreme Hellboy, the movie 8" line (including the Nazi Kroenen in the second series), the 18" version, and even some Mez-itz. 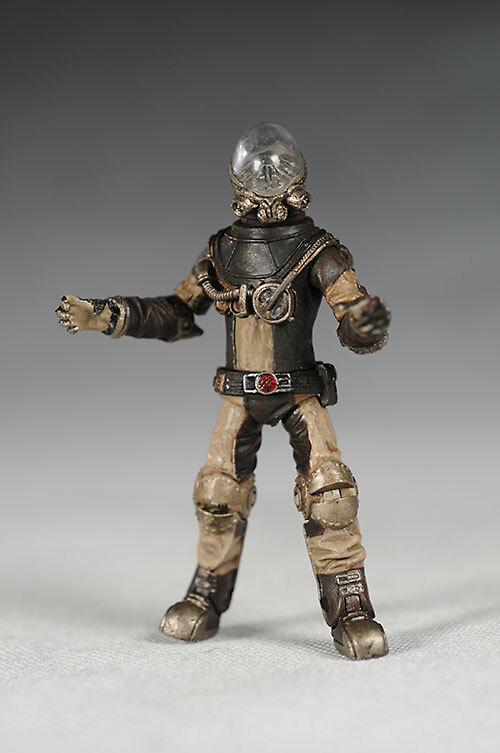 - also movie based, Sideshow has done several 12" figures, including Abe Sapien, Nazi Kroenen, regular Kroenen, and regular Hellboy. - for those into mini-busts, there's also this version that came with the release of the DVD.